This is a genuine question – What are the merits of a Letter of Credit to an importer? How does LC help an importer? Is Letter of Credit a safe mode for an importer? While accepting a LC, the supplier guarantees to meet the terms and conditions of letter of credit with documentary proof. This is one of the major advantages of LC to an importer/buyer. This assurance provides security to buyer for future business plan. Since buyer is the holder of Letter of credit, Bank acts on behalf of buyer. Opening bank remits amount only after satisfaction of all terms and conditions of letter of credit with documentary proof. This arrangement protects importer and minimize time, as bank acts on behalf of him. A letter of credit transaction reduces the risk of non performance by the supplier, as the supplier prefers LC than other transactions due to various reasons which protect him than the buyer. 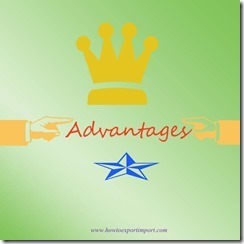 This is an advantage for the buyer on fulfillment of meeting commitments on shipments. Another advantage of letter of credit to a buyer/importer is that the exporter/seller receives payment of exported goods only after shipment and meeting of all necessary requirements under LC terms and conditions with presentation of documentary proof including evidence of shipment. Unlike other shipments, a shipment under Letter of credit is treated with most care to meet delivery schedule and other required parameters by the exporter. The documents receive by buyer promptly and quickly with complete sets. Unless meeting delivery schedule and prompt documentation, the supplier does not get his payment from opening bank. This is one of the major advantages of LC for an importer is concerned. An importer/buyer is concerned; he can plan his payment schedule properly by anticipating the requirements under letter of credit. This arrangement makes importer for easier planning. Based on timely delivery schedule, buyer receives goods on time thereby he can execute his business plan smoothly and efficiently, in turn satisfying his clients promptly and effectively. You can also read more information by clicking Letter of credit - How does LC work? What are the advantages of Letter of Credit to Exporter? Are there any disadvantages to importer for a consignment under Letter of Credit? What are the disadvantages of LC to an exporter? Who are the parties involved in Letter of Credit? How to check authenticity of LC? What is Prime Banker? Yes, I am sure, once after going through those articles you will have a good knowledge about Letter of Credit. In this article I have explained about the advantages of Letter of Credit to Importers. Have you satisfied with this article about advantages of LC for Importers. What is your experience in handling letter of credit as an Importer? Do you wish to add more information about advantages of letter of creidt to Importers? Share your experience on merits of Letter of Credit to importers. Akash Kakkad. : On 12 February 2015 I have recently joined the field of IMP-EXP. Can you pls let me know the things regarding SBLC how it works n how we can get benifits from this. what is the difference between LC and SBLC.? Sana Ullah : On 12 February 2015 We are very new in the import business, we are situated in thane district its near by mumbai, can send me step wise import prosedure ??? from start to end. Amit Maheshwari : On 14 February 2015 I'm planning to start a small venture of medical tourism where in foreign agents will refer patients for treatment in Indian hospitals. I'll get a commission from Indian hospitals and in turn I need to pay a certain commission to my foreign agent. I want to know what are the different methods (Banking and non Banking) through which I can pay commission to my foreign agents. I believe there will be no tax liability on the commission paid to foreign agent. Note - I'm a salaried person and will be working on this venture as a part time business. I've not registered a company for this venture. I'll include the commission received (less commission paid to foreign agent) from hospitals as income from other sources in my annual income and pay tax accordingly. akil : On 11 March 2015 I would like to know whether we can open domestic LC against an International LC? GST code for Management consulting and management services, information technology services.